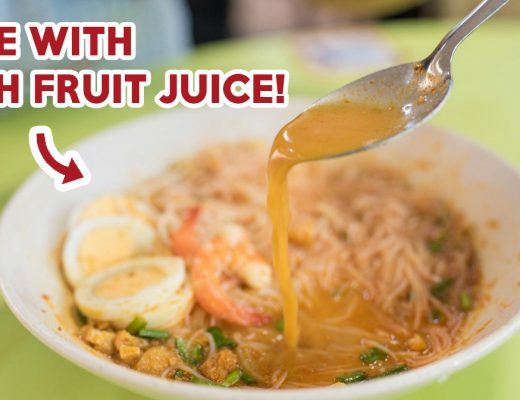 Update (3 Apr 2018): Wei Ji is relocating to 280 Woodlands Industrial Park E5, #01-47, Singapore 757322, and will resume business on 21 April 2018. 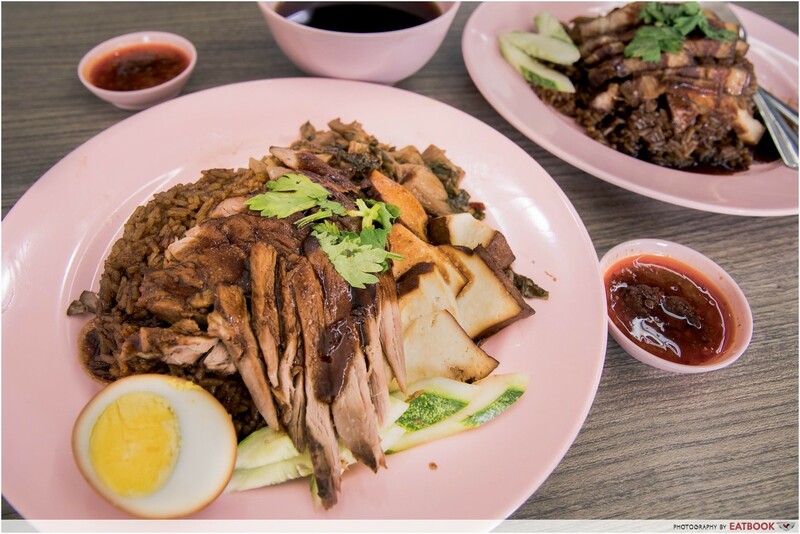 Braised duck rice is one of those dishes that most of us don’t usually think to eat as we step into a hawker centre. 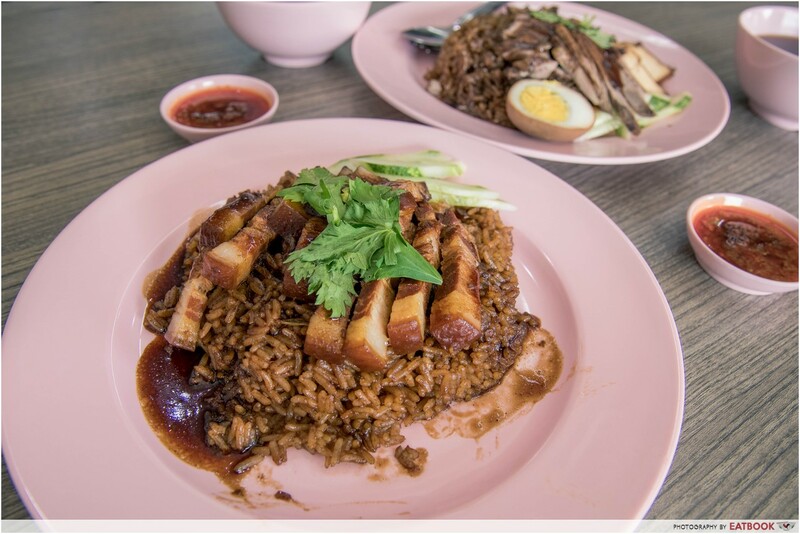 It’s not one of the iconic Singaporean dishes, and it even feels like the less popular cousin of roast duck. 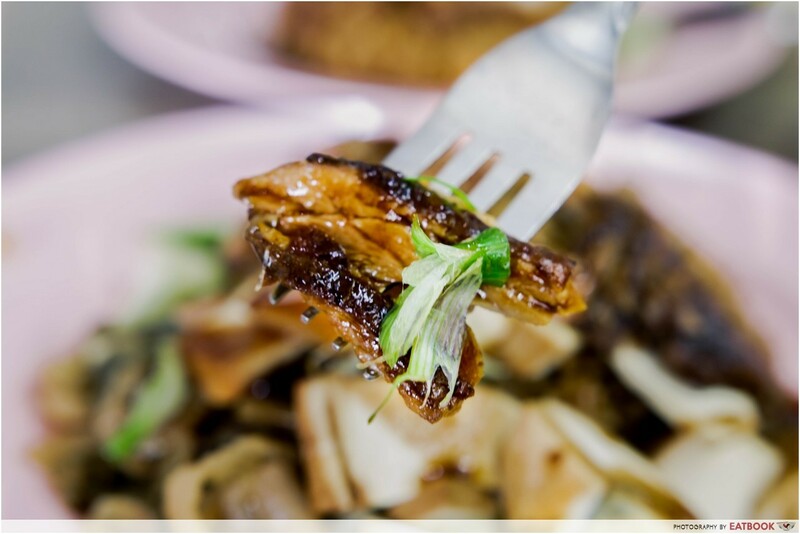 Besides there being fewer stalls that sell braised duck, the number of components to flavour right – the rice, the meat, and the soup – is what makes it even harder to find a satisfying one. Incidentally, this was one of those times I craved braised duck rice, and just wished I could get my hands on a plate that had enough herbal flavours to do the dish justice. 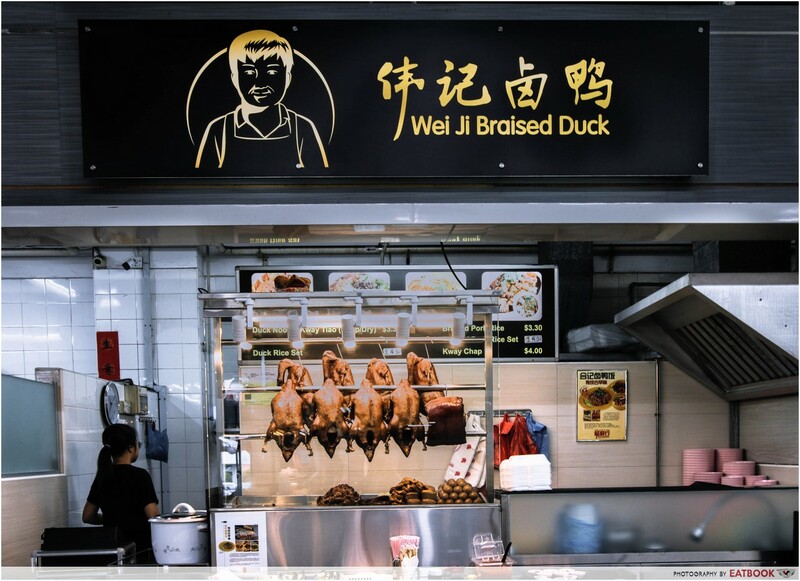 When I approached Wei Ji Braised Duck, I was excited to meet the mother and children who recently opened this stall. The family-run business sells traditional Hokkien-style braised duck and braised pork rice, which I was eager to try. It was easy to spot Wei Ji in the industrial kopitiam with its black signboard. A petite young girl with round spectacles stood behind the counter. 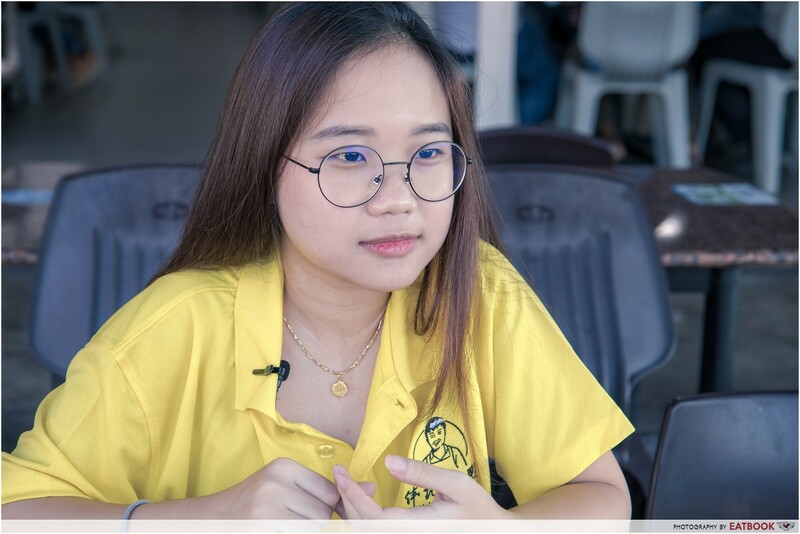 You’d think she was 16 or younger, but Kennie Rosemary Ng is 20 and now the head of the family. 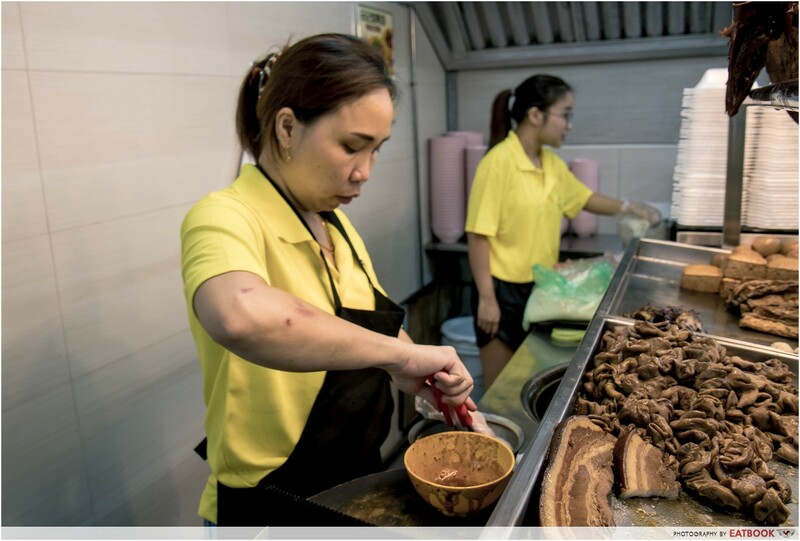 As the eldest of four children, each three years apart, she recently took over her late father’s stall to help shoulder the responsibility of taking care of the family. 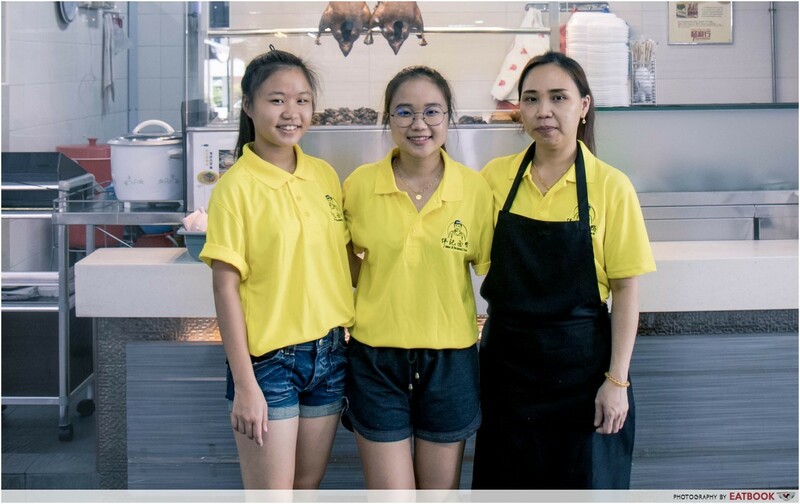 While finishing her private diploma in international business, she and her siblings have been helping their mum run the stall. Although it’s only been a few months since Wei Ji opened, the family business first began under another name. Her late father who was the sole breadwinner started He Ji Braised Duck when he was 14. When he passed on in January after a three-year battle with brain cancer, Kennie’s mother decided to take over with what she learnt from him. All their money was put into this and they rebranded themselves as Wei Ji in memory of his name, Ming Wei. 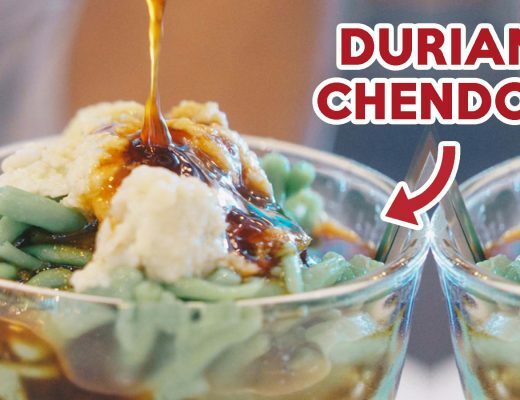 Kopi Chwee Food Court may seem like an inconvenient location, but besides the larger work area provided by industrial coffee shops, this is also where Ming Wei first opened He Ji. The stall shifted locations a few times over the years but old customers who missed their food travelled to ask them to return. It’s filled with memories of Kennie’s father, and a caricature of him on the new signboard looks down over them as they go about work. The hawker trade is unimaginably tough and Kennie started helping out her father in secondary school as he wanted to teach her about hardship. In the same way, although she would prefer to run the stall on her own, she wants to make sure her younger siblings learn independence and how to cherish what they have. At the end of the day though, she wants them to try what they’re interested in, and know that the braised duck stall is always there for them. It’s easy to see she takes after her father. When asked how she feels, Kennie says it’s simply part of her life since her paternal relatives are hawkers themselves. Breakdowns happen from time to time but she always picks herself up, believing that nothing could be harder than losing her dad. Beginnings are always difficult but it’s a phase she knows she has to pull through to continue what her father left behind. Hawker life can be very competitive and lonely but her two close friends and boyfriend are her source of support and encouragement. A typical day starts at around five in the morning, where the family prepares the ducks, pork, rice, and soup. They work for almost 14 hours daily. On weekends she deals with the suppliers, handling cheques and accounts, and once a week, they make a trip to Chinatown to buy herbs. Costs are high and are sometimes hard to cover, but they never compromise the quality of their food. As long as she can lighten the hardship on her mum, she takes it in stride. The occasional customer who appreciates their food lifts her spirits, making her feel like her efforts have paid off. Kennie looks like a young girl and like she said, she still is. She goes out on dates, she likes cute things, but she just doesn’t have as much time for them. Her story of resilience makes it hard to remember that and sometimes, she herself can scarcely believe it. Comparison is the thief of joy so she tells herself not to, and if anything, she knows she runs her own business. Wei Ji gets busy come noon on weekdays with a steady line of customers, but business isn’t as brisk as Kennie feels it should be. Many of their old customers haven’t heard that they’ve returned, and the younger crowd here just isn’t as interested in braised meat than roasts. Nevertheless, she comforts her mum whenever the worry gets to her, and believes it’s just a matter of time. 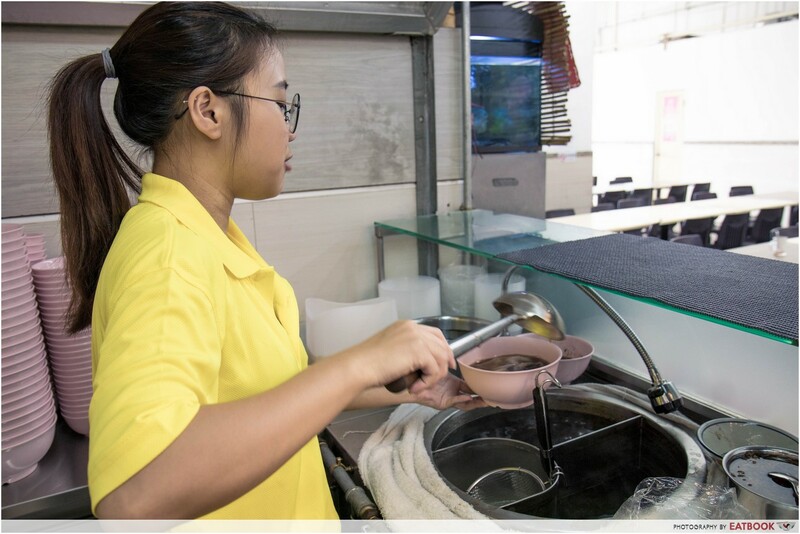 Her future dreams to move Wei Ji into a restaurant and expand into Indonesia, where her maternal relatives are, just shows how strong her willpower is. We ordered a Duck Rice Set ($4.30) which includes half a braised egg, tau kwa (braised tofu), and mei cai (preserved vegetables) on top of their regular Duck Rice ($3.30). I received a weighty plate with carefully arranged ingredients, which seemed to display the pride they took in their food. Gravy was ladled over boneless duck meat, and each slice was slightly chewy with just a little gaminess. The tofu and mei cai nicely balanced the heavier flavours. 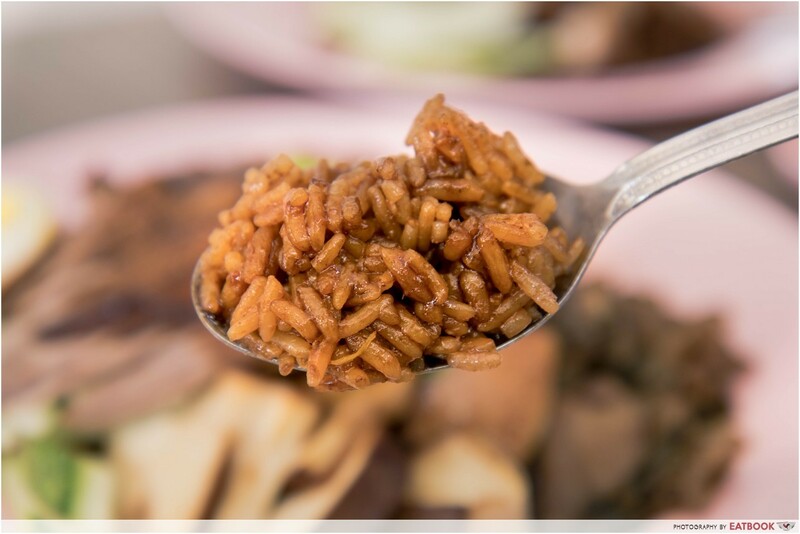 Unlike the Teochew style, their rice doesn’t have yam. It was savoury and fragrant from the braising sauce used to cook it, and was tasty even on its own. The grains were distinct and not too moist and the meal simply felt generous. 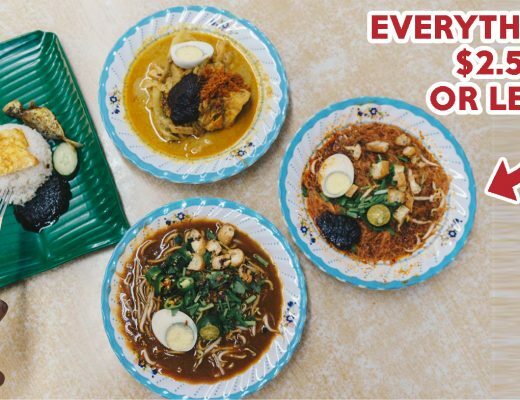 Each plate comes with a bowl of dark herbal soup. A sip of mine was clear and light, with a distinct herbal aroma at the same time. It was remarkable how gao (rich) it tasted considering their affordable prices. 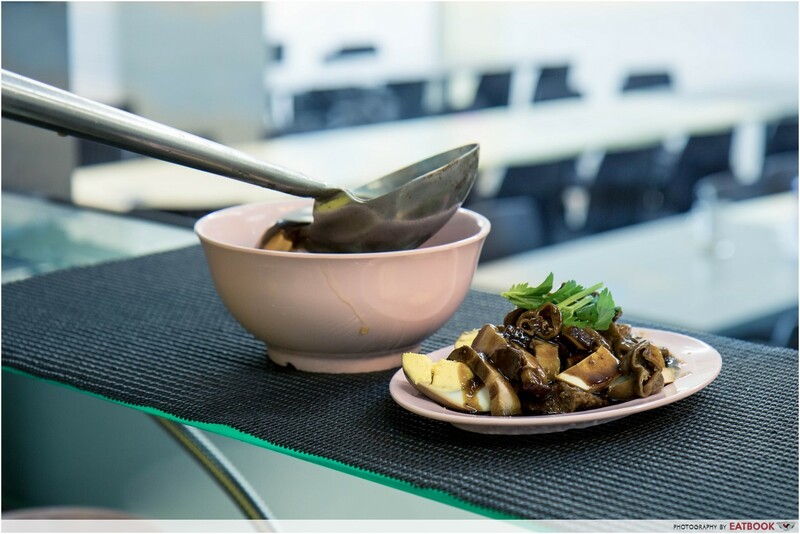 Duck bones were simmered with herbs like dang gui (Chinese Angelica Root), and gan cao (licorice root) for three hours to make this. 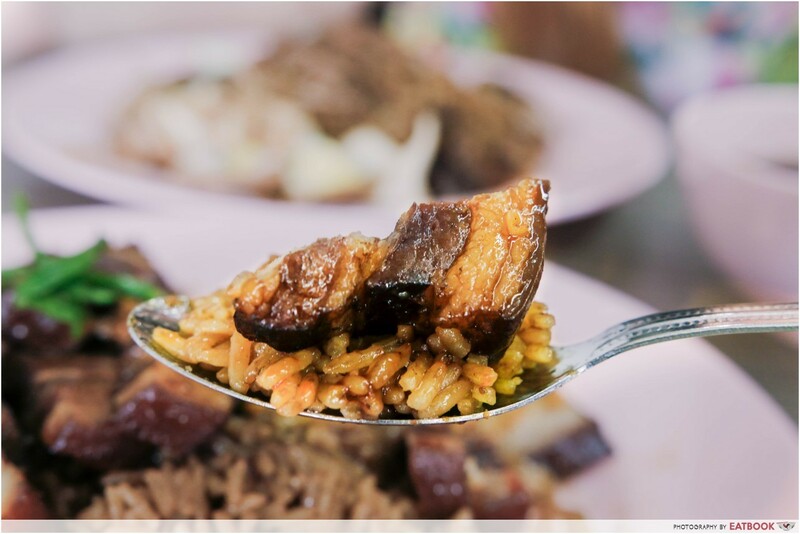 We also ordered their Braised Pork Rice ($3.30) without the set, and I watched as a deliciously fatty chunk of pork belly was pulled up from the pot to be cut into chunks. It made this plate look like a much bigger meal than their duck rice. The soft fats were lovely and the meat was a little chewy. The rice in this meal tasted more delicious from the pork belly although it was ladled with the same gravy as the duck rice. While the first plate was salty and savoury, this mouthful started with subtle sweetness which turned salty as I chewed. I couldn’t help but like this one better. There are two types of house-made chilli and we were served a saucer with both kinds. The sambal chilli was especially piquant with belacan and ikan bilis. 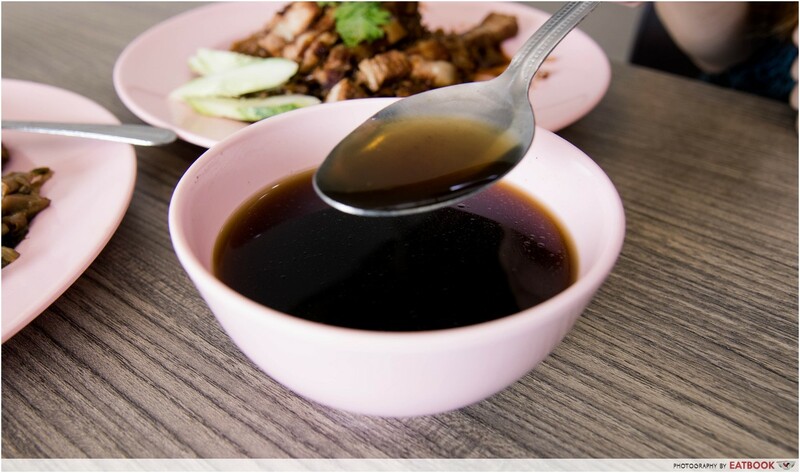 It added slight spiciness and depth of flavour that made the meal toothsome. 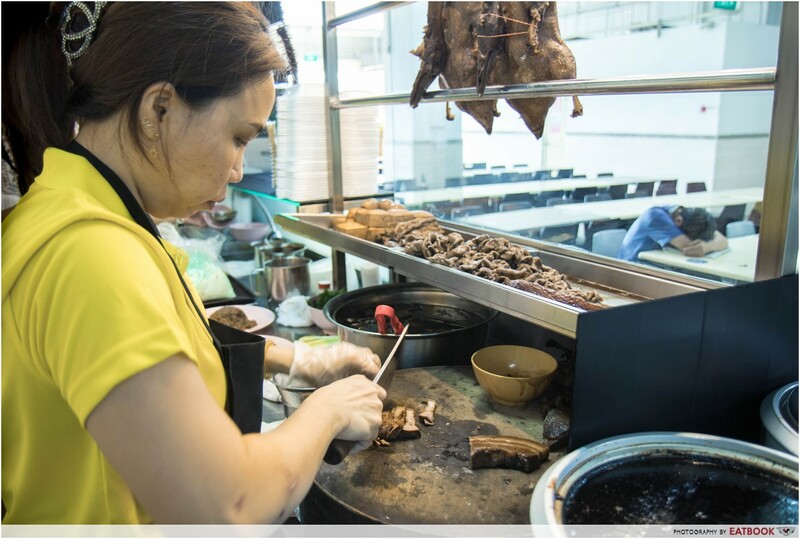 As we celebrate young hawkers who make us hopeful about the future of our beloved food heritage, Kennie’s inspiring story of loss and strength reminds us that they are also stories of the human spirit. The taste of their food is something I will remember whenever a craving for braised duck hits. What she shared with me though, is something I will remind myself with whenever I hit a rough patch in life. 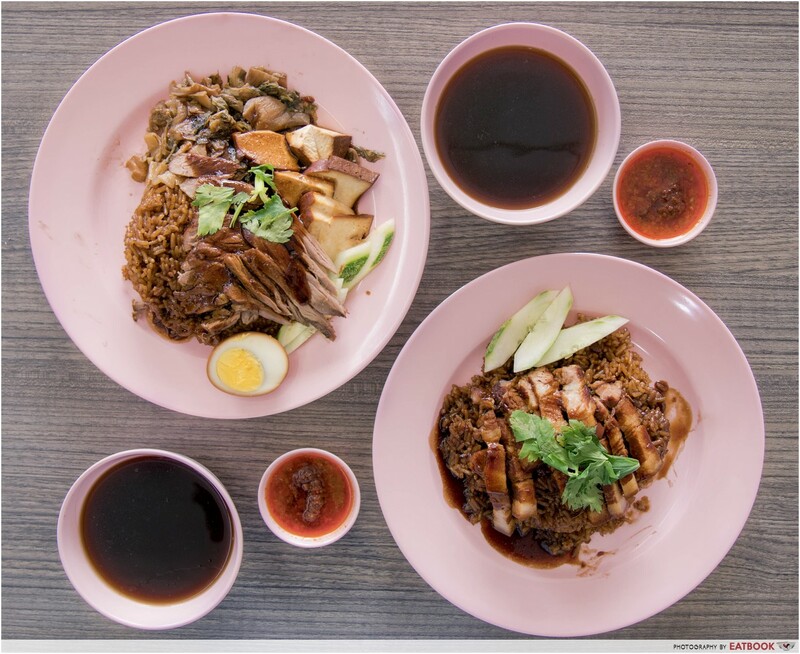 For more inspiring stories of young hawkers, check out the interview of Melvin from Jin Ji Braised Duck as well as these young hawkers in Singapore! Wei Ji Braised Duck is not a halal eatery.